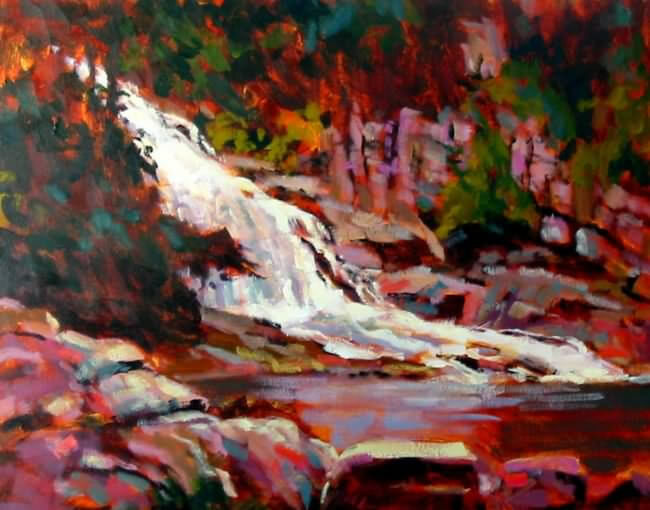 Being a self-taught artist, I have derived much of my inspiration from the “Group of Seven”, the French Impressionists and the Writings of Baha’u’lla’h (Bahá’í Faith). 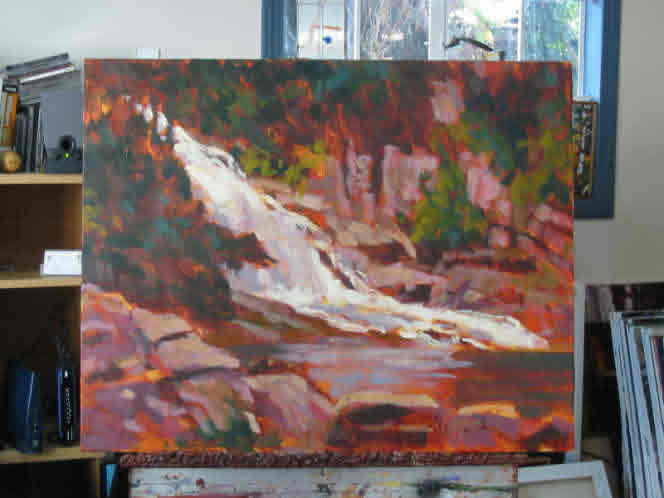 My family and I moved to Vancouver Island from Alberta, where I first began to paint approx. 25 years ago. Prior to that time, I focused mostly on drawing and sketching. I began showing my work in 1988 and have been represented by numerous galleries on the Island. From 2006 to the present, I paint on a full-time basis and have had many successes and confirmations in that period, including numerous commissions for a television production company, architects several corporate and private collectors both in Canada and the United States. 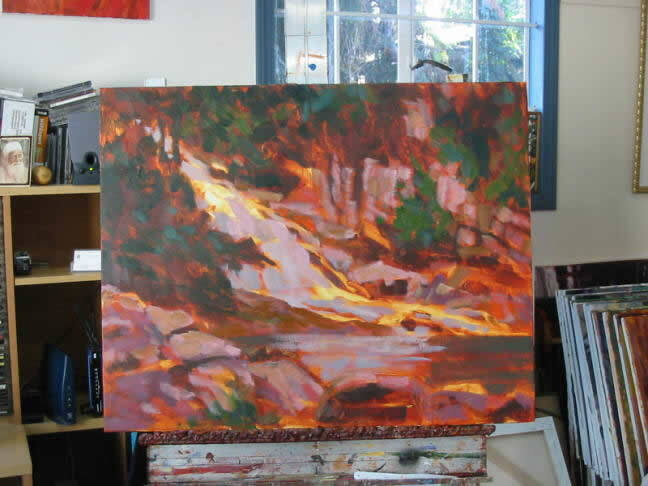 I also conduct acrylic painting workshops British Columbia, Alberta and the United States…. 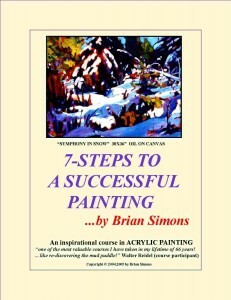 A 125-page, full-colour ebook (pdf) Acrylic Painting Course by Artist Brian Simons. Only $29.95 Can. This Acrylic Painting Ebook is based on the artists highly successful painting workshops that have been running in Victoria, British Columbia, Canada, for the last 6 years. It is an inspirational, thought-provoking, instructional book for both beginner and expert alike. NO PREVIOUS DRAWING OR PAINTING EXPERIENCE IS REQUIRED! Having seen literally hundreds of people, (many with no experience) go through this course and come out inspired by the works they produced, Brian feels anyone can paint. A lot of emphasis is placed on the spiritual aspects of painting and helping the painter to get out of the way and allowing the painting to work, as well as diffusing many of the myths that surround art and artists. 7-easy to follow steps from start to finish. 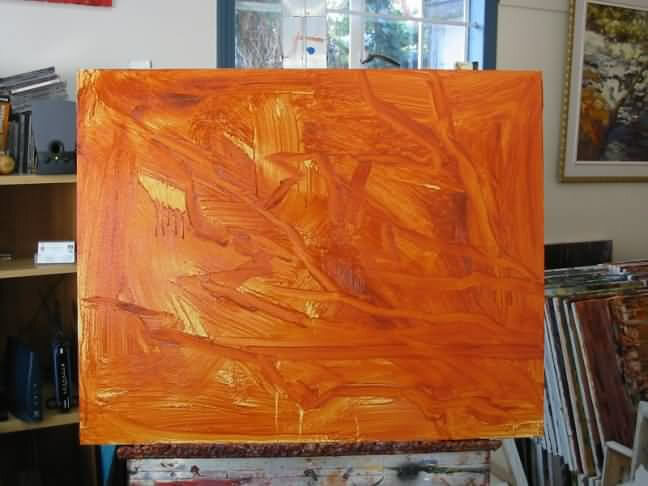 The second step is to underpaint the canvas. 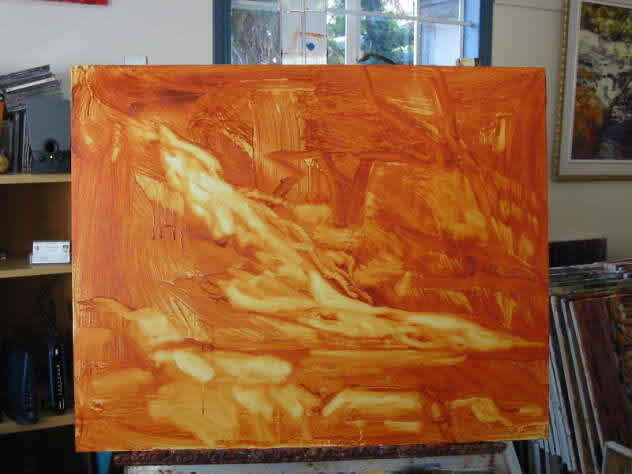 Here I used “burnt sienna and a large house brush. The idea is to simply cover the canvas in a “painterly” manner without any regard for the subject! At this point, using burnt sienna and a large artist brush we simply “map out” and identify the big shapes we see in the image. Squinting is required to see the big shapes. No real drawing, just mapping in a few shapes and breaking up the format of the canvas into pieces of a big puzzle. Once were happy with the “big shapes” and have pulled paint away from the lightest areas, we then start our “value study”, a study in lights and darks only. We do this by starting with the darks and use a bit of dark purple to darken the burnt sienna for the darkest darks. 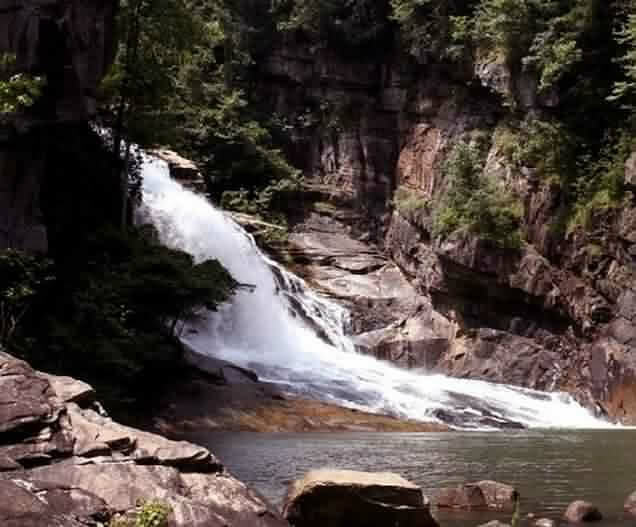 Then with we establish the other values , paying special attention to the value differences. We are looking for 4 or 5 different values. Once the “value study” is complete, we then start blocking in the colors starting with the darks and working towards the lights. Keep the paint thin, this is only an estimate. 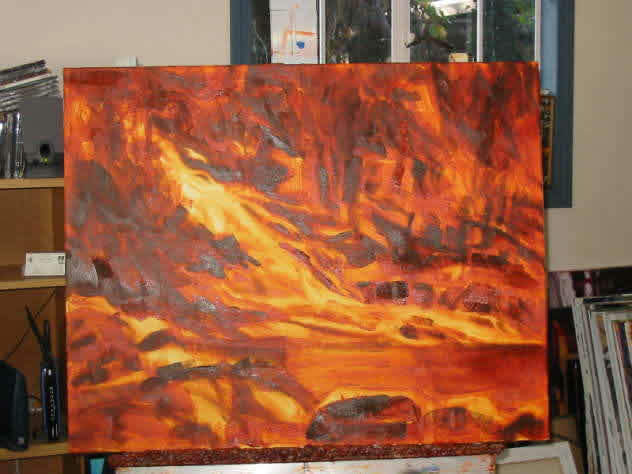 Let lots of the burnt sienna show through. Here the “block in” is nearing completion. We cannot assess any colours until we get them all “roughed in” and see them in relation to all the other colours. 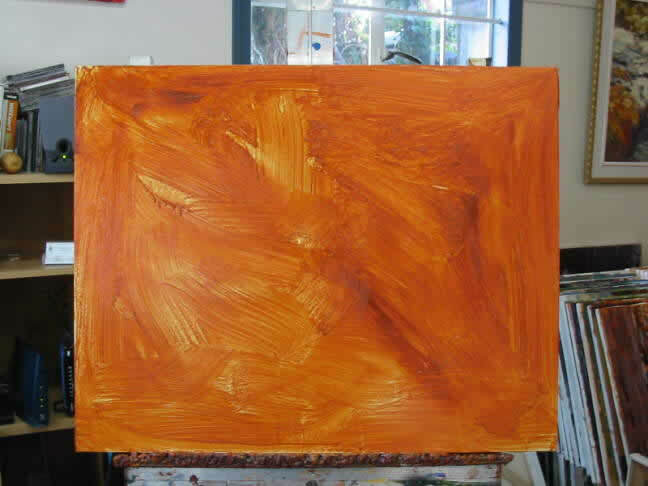 “7-STEPS TO A SUCCESSFUL PAINTING”,a complete course in acrylic painting. The book is available in three different formats on this site! You might also consider a workshop! I am by no means an art painter but I really like the results!